As I announced last Friday, Multiplex for iPhone and iPod touch is now available in the iOS App Store! Version 2.0 has been completely rebuilt with a great new interface, so for the 10% of Multiplex readers who visit the site on iOS devices, I highly encourage you to try out the app. I use it on my iPad mini, and while there is a laundry list of features we need to add to the app (including, obviously, an iPad-specific interface), I’m really proud of what we’ve built so far. Version 2.0 is such a big upgrade over the previous version that I wanted to get it into your hands with relatively few new features beyond the interface. There are many more features to come — but I honestly think it’s already the best webcomic reader app I’ve seen. This totally custom experience is the reason I wanted to build an app just for Multiplex rather than see it shoehorned into some one-size-fits-none interface with a dozen other comics. • Want to jump around the app a little more quickly? 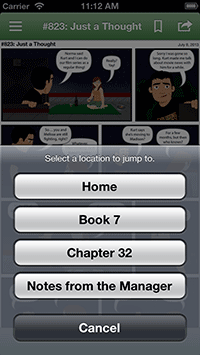 Long press (tap and hold) the Info button at the bottom left of the strip view to pull up an action sheet taking you to the strip’s current chapter or book page — or to the Home screen. • Want to view all your bookmarks a little more quickly? Sure, you can get to the Bookmarks menu from the Home screen, but you can also directly from the strip view by long pressing (tapping and holding) on the bookmark icon in the title bar. • Going on an archive dive? Hide the interface while reading strips by simply tapping on the image. • Lastly, I wanted to acknowledge that there is one known issue with the new app so far. On very rare occasions, the Notes from the Manager for a strip may not load. We’re trying to get to the bottom of this, but when this happens, you can tap on the view three times to force it to reload the contents and that always fixes it. Enjoy! And please remember to rate or review the app if you like it. (And if there’s anything you don’t love about it, please send us feedback!) Helping get it in on as many devices as possible justifies our continued development of the app. This entry was posted on Tuesday, July 9th, 2013 at 00:00am	and is filed under Etc..